This election saw the highest youth voter turnout for midterms in almost a quarter century. In communities across the nation, OYUnited has been working hard to empower young people to vote. This midterm election marked historical voter turnout, including among youth. CIRCLE, a nonpartisan research institution, estimates that voter turnout among young adults (voters between the ages of 18 and 29) went up by 10 percentage points, making this midterm the highest youth participation at the polls during a midterm election in almost a quarter century. Young people across the country made it clear at the polls that they care about our democracy, know the issues, and will show up at the polls to hold elected officials accountable. Many people were surprised by the historic youth turnout levels, but here at OYUnited, we planned on it. Last year, we decided that if we wanted to shape the political discussion and have the issues we care about at the center – like the mass incarceration of our brothers and sisters, the lack of investment in our communities, and the lack of pathways for higher education and a living wage – then we’d have to mobilize young people across the country to show up at the polls. Thirteen of our Community Action Teams (CATs) across the country started planning their Civic Engagement Campaigns for the 2018 midterms a full year in advance, and began implementing this spring, focusing on civic education, voter registration and voter turnout among young adults and all community members. These communities were Atlanta, Boston, Chicago, Columbus, Los Angeles, Philadelphia, Greenville (MS), NYC, New Orleans, Phoenix, Seattle, San Francisco and Sacramento. In Seattle, our CAT led a series of events to energize and inform young voters, and to boost voter registration. Our anchor organization, SOAR, is an intermediary in the midst of transition. 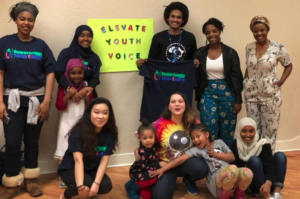 I was hired in a new position, as Youth Voice Organizer in September of 2017 and tasked with working closely with community and launching our Seattle community action team. As a transplant, I learned a lot about the region. I learned about the inequities between South King County and Seattle, I learned about the lack of youth voice, and most importantly I learned that Opportunity Youth in King County were not being engaged civically, so our team decided to engage our community in different ways. We hosted open mics, an event with the secretary of state as the keynote, a block party, pizza ballot parties, door knocking, voter registration at alternative high schools, homeless shelters, and re-engagement sites. We set up tables at youth detention facilities and in parks to register youth and talk with the community. We also collaborated with local elected officials, supported education initiatives to increase college access on the ballot, and ran campaigns on social media. The Seattle team was busy: With only four young people serving as voter engagement ambassadors in Seattle, Kent, Auburn, Federal Way, and Burien/White Center, we successfully engaged 500 people, registered 50, and helped 10 people return their ballots to ballot drop boxes! In Chicago, the OYUnited CAT is proud of the impact we measured this election. The CAT focused its voter turnout efforts on precinct 10 in Congressional District #4 (a precinct is the smallest division of voting areas, known in some states as an election district). The comparative voter turnout in this precinct was as follows: in 2014 there were 147 total votes cast, and in 2018 there were 363 total votes cast – an increase of 216 voters, which translates into a 246 percent increase. OYUnited and our CATs are committed to continuing to help our peers register to vote, show up at the polls feeling informed and ready, and stand up and speak up for our communities and our future. We need you to help make this happen! Please click here to join OYUnited. Makayla Wright is the Youth Voice Organizer for SOAR, a Seattle-based community coalition working together to promote the healthy development of children, youth and families in Martin Luther King County and the anchor organization for the OYUnited Community Action Team (CAT) in Seattle. Makayla grew up in Leavenworth, Kansas. As the child of former Opportunity Youth who never went back to school to get their GEDs, she realized how important it was to work with young adults in similar situations. Makayla graduated from Smith College and has worked in educational outreach programs, youth residential treatment facilities, charter schools, and as an Academic Coach. As a Black woman from the Midwest, she is passionate about exploring root issues and working with communities, and now advocates for youth and young adults by convening the King County Youth Advisory Council and organizing the King County OYunited CAT. Adam Strong is a founding member of OYUnited and member of OYUnited’s National Council of Young Leaders. 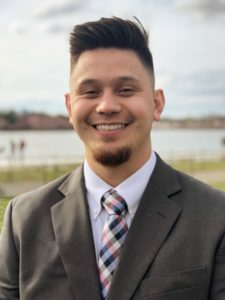 A passionate advocate and lifelong learner, he has six years of experience in national policy advocacy, using his skills in policy analysis and communication & strategy he aims to influence policymakers to implement policies that increase economic mobility and decrease poverty in America. More from Adam.